​Alex Jensen discusses Korea's decreasing birth rate with Alaric Naude and whether or not this trend can be reversed. Crossing borders is much more than just moving past a man-made barrier. The most powerful of borders has no walls, wires or security because the most difficult border to cross is the human mind, which can shut itself more tightly than a prison in the cruelest of dictatorships. With this seemingly impenetrable wall in place, how can the mind be crossed in order to make students more receptive to learning? What factors undermine the ability of an educator to effectively conduct lessons and how can these be overcome? 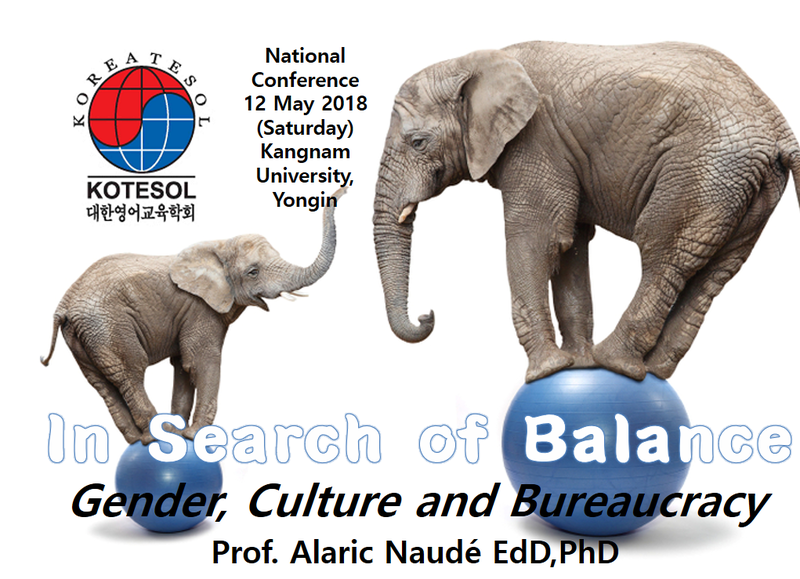 Come on a journey with a sociolinguist and gain a deeper understanding of the labyrinth of issues in education such as gender, culture and bureaucracy. Gender is an area of concern where there is a consistent bias in terms of education and this must be addressed. Gender discrimination in the classroom must be promptly dealt with, but how? A groundbreaking concept will be introduced, rather than gender equality, the new philosophy of gender equivalentism. Further, culture has profound ramifications on how the learning process is understood. How can culture be utilised, overcome or sidestepped? Then, the nightmare, yes a seemingly never ending abyss, the quagmire that stops progress, bureaucracy. Learn how to make allies and friends in the system to streamline learning and improve its quality. Not a presentation for the faint hearted, making you question what you understand and how you understand it. Technology has always been the subject of heated debate. In every age, this seems to be a reoccurring issue. In the industrial age, there was a backlash where workers felt threatened by the advent of new machinery. That was then, however, in our age the hybridisation of man and machine has been a growing reality, inspiring all manner of science fiction film and novel. Humans are now more connected than ever in history, with this interconnectivity there comes many problems. For the teacher the management of technology in the classroom and the exclusion of the undesirable effects of excessive technological use are areas of concern. Also, the outsourcing of educational expertise on digital formats means that the role of the teacher in some places is being redefined. Guided by an expert in the field and member of the Belgium-Netherlands Cognitive Linguistics Association this dialogue will take into consideration the sociolinguistic and cognitive linguistic reasons that even sophisticated technology or hominoid robotics cannot replace the human teacher. It will also discuss how teachers have integrated technology into the classroom as well as the superiority of the face-to-face format of teaching as opposed to the purely technology based approach. In addition,the will be discussion on the points of caution and the ethics involved in the use of technology especially the need for caution in social network services and how student interface with technology can be appropriately controlled. Audience members will be expected to participate and give their views as well as share their experience and ideas. The human brain is perhaps the most complex structure in the universe with neurons interacting through electro-chemical signalling. A discussion of basic neurobiology both anatomical and cellular will be undertaken, further, the aforementioned methodologies will be expanded on and explained with audience participation and input being most welcome. Furthermore, the most up to date scientific understanding of brain function and anatomy in relation to language will be presented. Feminism stems from the desire of equality for females and to enhance their rights within society. While being a noble endeavour, the original purpose of and search for a higher ethic which was promised by feminism have both been derailed by undesirable elements. Further, more traditionally conservative countries are resistant to the idea due to these undesirable elements being viewed as an affront to traditional values and an attack on the culture itself. The argument in such cultures is that both genders are inherently different and therefore cannot be equal. Antiquated as this viewpoint may be, there is a need to educate people in a way that is more acceptable and appealing to the general society and not merely to force feed a concept in the manner that many feminist ideologies have insisted on. To promote the equal rights of girls and women a concise and universally acceptable core or theoretical framework is required, one which embraces the differences between genders whilst demeaning neither for any such difference and going further to accept that such differences may not apply to every individual. “The theoretical framework of gender equivalentism” provides a compendious framework for ethical behaviour to ensure the equal treatment of women without the need for a strictly feministic interpreted approach. Newton’s Third Law was written as a foundation for much of the understanding of physics. However, the underlying principal of oppositional forces is applicable to various fields of understanding, including the sociolinguistic understanding of semantics. Ethnic groups, governmental forces, institutions of learning and religion all interact to change language and be changed by language itself. While this is a known fact, documenting or understanding the exact interchange and opposition or interaction between two forces has not been sufficiently explored. To facilitate this exploration, the Naudé Hypothesis provides a simplified basis for the theoretical framework and a linguistic model from which to analyse patterns that result from the oppositional forces of two interacting entities in an attempt to understand the meaning behind meanings- semantics. Humans’ long relationship with technology has been characterized by distrust and resistance to change. Our biology is designed for language use yet in pedagogy we as a species exhibit the same distrust of technology due to its perceived potential for change which is then often vehemently resisted. This discussion attempts to highlight genetic factors in social language use, the way in which technology has augmented the way humans learn language as well as notes of caution and encouragement in the implementation of technology in pedagogy. Interlinear Transliteration of Plate 538 in 3 Fragments of Greek Minor Prophets Scroll from Nahal Hever based on the original text in 1st Century Greek. Plate 538 of the Greek Minor Prophets is part of the collection of Dead Sea Scrolls currently under the masterful care of the Israel Antiquities Authority. The scroll is common of the era being parchment with Greek Uncial script and is a translation of Hebrew Masoretic texts for either personal use or for the sake of proselytising. It is part of a collection of 981 texts which have been excavated in the areas surrounding Khirbet Qumran from 1946 onward. Plate 538 is comprised of three fragments containing portions of Zechariah chapters 8 and 9. Translation of fragment c. 1450 of the Torah from Ben Ezra synagogue, Egypt. ​​The preservation of ancient texts is vital for understanding not only culture and ensuring the survival of traditions but also to safeguard this linguistic heritage for future generations as well as to give more scholars access to manuscripts, thereby allowing for translation and expansion of linguistic knowledge. Cross comparison of texts and translations can then be conducted for the purpose of understanding grammar, content, stylistic change over periods and to ascertain the reliability of copies when compared over large periods of time. The translation of the Naudé Fragment from Ben Ezra Synagogue is such an attempt. This fragment written circa 1450 provides a brief insight into the scholarly work of Hebrew Soferim (סופר תס“ם (during the Islamic rule of the Mamluk Sultanate of Egypt ( سلطنة المماليك Salṭanat al-Mamālīk). This will further provide a source of comparison for Bible translation in unison with the use of older and newer copies of the Sacred writings. Inability to reproduce proper phonetic patterns or structures. Application of native language syntax in when using English. The reintroduction of borrowed words using incorrect modified Korean phonetic structure. Cultural aspects that inhibit language acquisition. 한국의 영어교육은 큰 비용을 차지하는 산업으로 전세계의 영어권 국가에서 다양한 전문가들이 모이고 있습니다. 언어 연구에 있어서 많은 관심이 주어지지만, 많은 원어민 교사들은 여전히 통사론과 음성과 관련된 면에 어려움을 겪고 있습니다. 이 과제는 한국의 문화의 이해에 부족과 한국어가 어떻게 쓰이는지 뇌에서의 사고과정의 차이를 이해하지 못함에서 비롯됩니다. 이 글에서는 영어를 배우는 한국 학생들이 가진 다섯가지 부면에 초점을 맞추었습니다. Although multilingualism is by far a new concept little has been done to further the subject in relation to neurolinguistics. The general mood of the education system is too permissive and stagnant, both educational facilities and educators alike should adjust their techniques for their pupil’s benefit. Teachers need to be advised as to how language is acquired and exactly how customs and culture as well as multilingualism in society can affect student perceptions concerning language learning. Further they need to gain a greater understanding of the neural aspect of language learning and the anatomical as well as biological processes involved in learning. Also to see how multicultural environments benefit language learning by means of social views connected to languages. 多言語는 새로운 것이 아니지만 , 多 言語 및 神經言語學이 어떤 關係가 있는지 愼重하게 硏究되지 않았습니다. 現在 敎育 시스템은 停滯 되고있습니다. 敎育 機關과 敎師들은 자신의 생각을 變更해야 합니다. 敎師는 言語를 獲得 하는 方法도 理解할 必要가 있습니다. 敎師는 또한 敎育學 技術을 發展시켜야 합니다. 이것을 變更하면 問題가 생길 수 있습니다. 腦와 生物學的 過程 은 言語 學習 의 基礎 입니다. 文化와 環境 은 言語 學習에 影響을 줄 수 있습니다.